This article is sponsored by Miles Franklin. 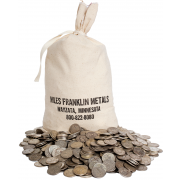 The St. Louis Federal Reserve publishes data on M2, a measure of currency in circulation. Data from the past 50 years shows that M2 has grown exponentially (straight line on a log-scale graph) at about 6.7% per year since 1971. The economy grew much slower. More currency in circulation creates higher prices. We pay more for beer, college tuition, food, cigarettes, political payoffs, gasoline and gold than in 1971, 1991, 2001, etc. 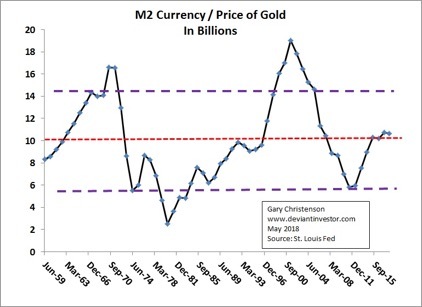 Although gold prices fluctuate, the price of gold increases along with M2. 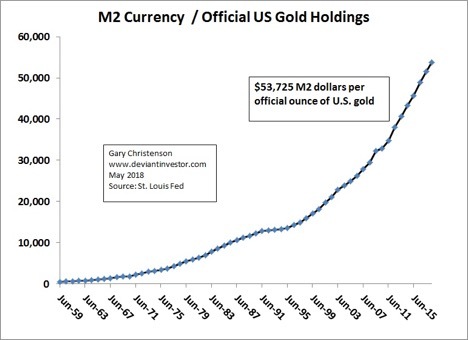 The graph below shows M2 (in $billions) divided by the price of gold. The official hoard of U.S. gold (more than half at Fort Knox) declined from over 20,000 tons in the late 1950s to about 8,133 tons in 1980. Before 1971 that gold backed a percentage of dollars in circulation. After 1971 dollars were created with few restrictions, which was profitable for the banking cartel and convenient for “spend-spend-spend” politicians. SO WHAT? FEW PEOPLE CARE ABOUT M2. GOLD IS PRACTICALLY A RELIC FROM BYGONE YEARS! The death of gold has been exaggerated. Russia and China increase their gold hoard each month. Confidence in the dollar and other unbacked currencies decreases. Politicians and bankers “print” continuously and the currency units decline in value every year. If a currency crisis occurs, which seems more likely every year, the world may back a new currency with gold to make that currency acceptable. Russia, China or the IMF might issue a gold backed currency. If another country issues a gold backed currency, governments might question gold backing for the U.S. dollar. How much U.S. gold remains? 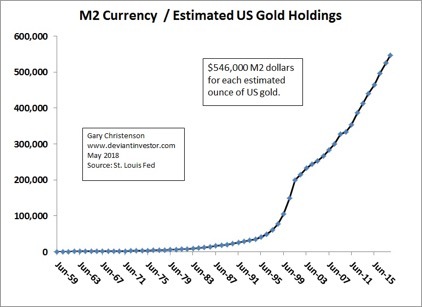 How high must the gold price rise to back the $ trillions in M2? Perhaps the central banks and governments can maintain the belief that currencies have value. If not, gold may become necessary to renew trust in central bank currencies. If people do not trust paper currencies, gold backing will re-establish trust. M2 is about $14 trillion. 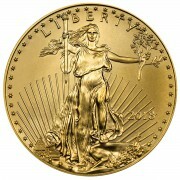 Official U.S. gold is about 8,133 tons or 261 million ounces. At 100% backing of M2 the price of gold would be $53,000. Not likely! But at 15% backing and gold priced at $8,000, people might trust the dollar and revitalize the financial system after a currency crisis. The price of gold exceeded $850 in January 1980. At 15% backing of M2 in 1980 the price of gold would have been about the same. In early 2018 each ounce of gold (official numbers) backs $53,725 in M2. The U.S. government has a dodgy history regarding truthful information about debt, honest accounting, 9-11, political assassinations, inflation statistics, WMD in Iraq, CIA overthrow of other governments, and NSA spying on citizens. Perhaps suspicion regarding official gold reserves is warranted. SPECULATION: What if the official gold hoard claimed by the government is about 90% gone? Reminder: the U.S. gold has never been independently audited. The last “in-house” audit occurred in the 1950s. “Audits” since the 1970s are less than convincing. Few people care and politicians see little benefit from answering questions about the remaining quantity of gold. The U.S. government had accumulated a massive stockpile of silver decades ago, but sold it by about 2001. Assume for this speculation that U.S. gold was also “reduced” (leased, stolen, pilfered etc.) down to 10% of official holdings by 2001. 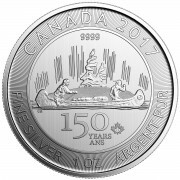 In early 2018 each ounce of gold (estimated and speculative numbers) might back $546,000 in M2. SO WHAT? WHY SHOULD WE CARE? What if governments and central banks must back their currencies with gold to restore trust? What price will gold command if the (speculative) depleted U.S. holdings back only 15% of M2? Answer: About $82,000 per ounce. Hmmmmm! The EU may buy oil from Iran in euros, not dollars. China and Russia have bypassed dollars for many transactions. China and Russia will increase their use of rubles and yuan in global trade and avoid dollars. Crude oil sells on Chinese exchanges for yuan. Those yuan will be convertible into gold bullion. The One Belt, One Road will eventually connect 60 countries, perhaps 65% of global population, and bypass the dollar. S. official debt exceeds $21 trillion and doubles every 8 to 9 years. Governments know The Federal Reserve does not preserve the value of the dollar and congress does not control spending. Whether the dollar is replaced in global trade next year or next decade is uncertain, but the trend is clear: more debt, devaluing dollars, higher prices and less global trust in dollars. The dollar devalues and prices increase every year. 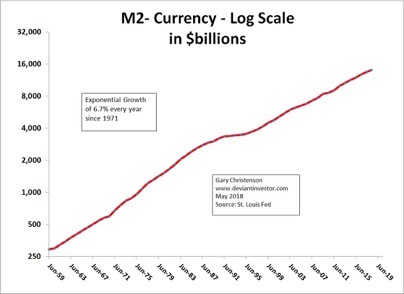 Currency in circulation (M2) exponentially increases about 6.7% per year. Global demand for the dollar is decreasing. Faith and trust in dollars is essential but may disappear. Gold backing may become necessary to restore faith in mismanaged fiat currencies. It could back IMF issued SDRs, Russian rubles, Chinese yuan or others. A large portion of official U.S. gold may no longer exist in government vaults. ASSUME only 10% remains unencumbered and available to back dollars. Assume that dollars require 15% backing by gold. Using these assumptions the price of gold would be approximately $82,000 per ounce. That is why M2, official gold and speculative estimates about actual gold remaining are important! 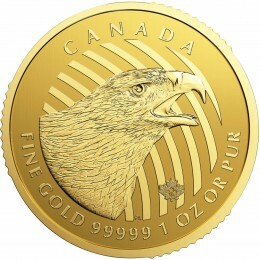 Gold bullion and coins are available because we believe dollars are valuable. That belief can be destroyed by excessive debt creation and over-printing of fiat currencies. 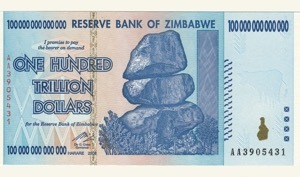 Many countries have inflated (over-printed) their currencies. Those currencies became almost worthless. As long as nothing tangible backs fiat currencies, price inflation will occur. Zimbabwe dollars, pesos, euros, dollars or gold? Choose gold!